‘to lead, inspire and shape the future of football by creating industry ready graduates. 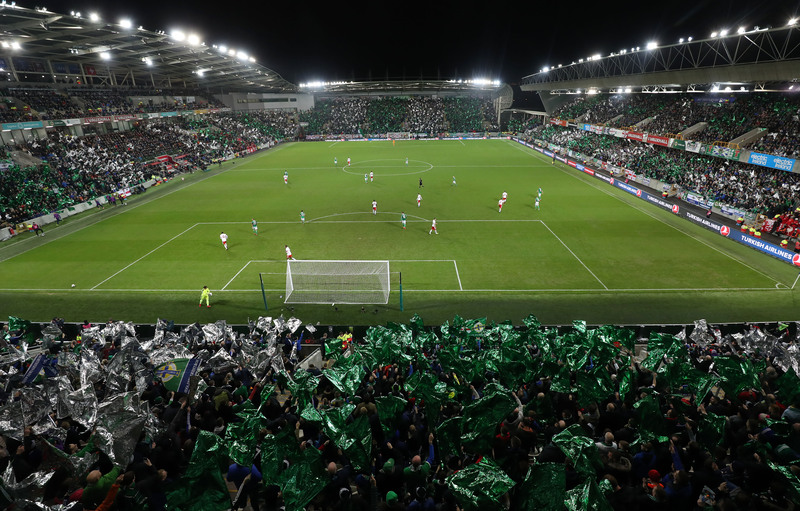 The BSc Hons Football coaching and Business Management degree is an unique course stimulating learning as part of an innovative curriculum taught at the inspiring National Football Stadium at Windsor Park. Delivered through a unique academic and industry partnership formed between Ulster University and the Irish Football Association. Designed to create industry ready graduates who can apply theory to practical situations. Producing the next generation of football industry leaders through a programme which will both challenge and support students. The course is delivered through an intensive block teaching involving four modules spread across the academic year each lasting one week, supplemented with on line tutorials and work based learning.This structure enables students to continue in full time employment then travel to Ulster for each week of study. A typical day on the course.will involve a practical case study presented by inspiring industry leaders, underpinning theory presented by University sports lecturers, peer learning and reflection in groups. placements. This can be offered on a part time, project based or full time basis. Network–Access to an exclusive collection of leading industry professionals through guest lectures and networking events., internships and networking events. Underpinning knowledge–The content of the course is informed by relevant research in the area of coaching and business management. Promoting application of theory in practice. Includes study exchange to a leading European football body or club (cost included in the fee). Industry qualifications–Students will undertake a minimum of UEFAB licence as part of their accredited studies (cost included in the fee). Inspirational Industry leaderssuch as the International Manager, Organisation CEO, Directors and key stakeholders in the global football industry. Student Experience–As a student of Ulster University you will have access to all the benefits a leading University offers, with more than 70 sporting clubs offering social and competitive playing opportunities. Transforming lives, stretching minds, developing skills and raising ambitions. The aim of this module is to provide a general introduction to the growing internationalization of the football business. Central to this is the development of the student's business skills and acumen. This module will provide students with a clear understanding of how sport is managed, administered and delivered and will underpin teaching in a number of related modules that students will encounter within the programme of study. It will examine fundamental concepts of sports management, strategic planning, sports development and sport for development and will highlight the key role of government in the implementation of sports policy. Through a series of lectures and tutor-led seminar sessions, students will understand the theoretical and practical importance of innovative leadership practice and sports psychology in leading teams and individuals to enhancing performance. This module will provide students with the principles needed to devise strength and conditioning programmes for athletes involved in team sports. Students will develop the practical skills and knowledge required to develop strength and conditioning through formal and informal learning opportunities. • Sport Matters (DCAL, 2008) recognises the importance of a qualified, competent and available workforce (paid and voluntary) is a key development input to the realisation of the Strategy vision. This module provides students with theoretical knowledge of the football and wider sports industries as well as case study examples and guest lectures from the football industry to allow the students to appreciate the management of football/sports development work in practice. This module will provide students with an opportunity to critically reflect upon their coaching practice while using action research to examine how academic knowledge and theory can be applied in a practical setting. The module allows students to demonstrate knowledge and skills that have been acquired in the course of their studies, building upon experiences throughout the programme. Through a series of lectures, tutor-led and participant led practical sessions students will develop a clear understanding of the essential components of safe and effective coaching methodology and develop competence in planning, implementing and evaluating effective coaching programmes at both participation and developmental level. This module will provide students with the knowledge required to evaluate the impact of sports science theories, principles and concepts on sporting performance and how these can be applied to a practical coaching environment. Through a series of lectures, seminars tutor-led and participant led practical sessions students will develop a clear understanding of the essential components of safe and effective football coaching methodology and develop competence in planning, implementing and evaluating effective coaching programmes at participation, developmental and performance levels. This module explores the background, principles and practices of the strategic management process, which organisations with the football industry employ to ensure competitive advantage over their competitors. Comparisons are made to the broader sports industry and business environment to identify unique practices and structures within football. The module is designed to ensure the students gain the underpinning knowledge and competencies to become potential managers in the fastest growing global industry of the 21st Century. This module enables students to enhance their theoretical and empirical understanding of the research process as it applies to sport. In so doing, it demonstrates the critical relevance of evidence-based practice to sport. The A Level requirement for this course is BBC to include at least one subject from History, Psychology, PE, Politics, Sociology, Geography, Chemistry, Physics, Biology, Business Studies or Sport Studies although entry requirements can vary from year to year but a minimum achievement of BBC in three A levels is required. Overall BTEC award profile DMM (to include a unit grade profile of 8 distinctions) in a sport or business related BTEC. Overall Irish Leaving Certificate profile of Higher grades H3,H3,H3,H3,H4. Specific subjects requried include two H3 Highers in the following: History, Psychology, PE, Politics, Sociology, Geography, Chemistry, Physics, Biology, Business Studies or Sport Studies. Plus English and Mathematics grade H6 at Higher level or grade O4 at Ordinary level. GCSE Profile to include: English language, mathematics and a science subject at grade C/4. Essential/Key Skills in Application of Number is not regarded as an alternative to GCSE mathematics. (a) Provide evidence of your ability to undertake the programme through the accreditation of prior experiential learning (APEL). Interviews may be part of the selection process. The course is taught in blocks with assessment and feedback built around constructive alignment theory. directed and self directed reading to supplement the learning and teaching process. study reports; research reports; class tests, critical reviews; reflective logs; oral presentations; multimedia presentations and peer assessments. Studies pursued and examinations passed in respect of other qualifications awarded by the University or by another university or other educational institution, or evidence from the accreditation of prior experiential learning, may be accepted as exempting candidates from part of the programme provided that they shall register as students of Ulster University for modules amount to at least the final 50% of the credit value of the award at the highest level. The Football industry is a £8 billion industry offering a variety of opportunities both locally and globally. The transferable skills developed as part of the course opens a range of additional options for graduates in coaching or business. Students will under take a 26 week internship, which can be completed as a full time 26 week placement or part time over a longert period, either on a regular basis or on a project by project basis.